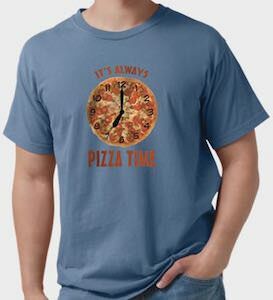 Now there is a it’s walls pizza time t-shirt for people like me that always can enjoy a slice. You can get this pizza t-shirt in styles for men, women, and kids and it is available in many colors and sizes. On the t-shirt you can see a yummy pizza and it also seems to be a clock as it has all the times on it and the hands of a clock and then around that nice round pizza it says “It’s always pizza time”. So get the message across to the world around you because everyone should be aware that it is always pizza time. What time is it ok to crack a nice ice cold beer? Well I am going to say anytime, just throw this t-shirt on and go. On the front of this red t-shirt you will see a simple digital clock display, but have a close look and it is not a time at all it reads as “BE:ER” with the text under that says “O’Clock”. The beer t-shirt is available in a wide selection of sizes that range from Small to 4XL and you get a choice of 8 different fun and vibrant colors. Made from 100% cotton to give you that very comfortable and super soft feel aswell as super durable. 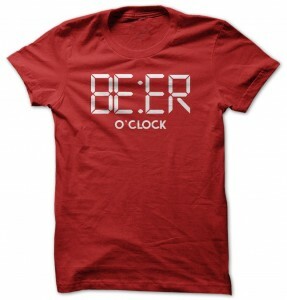 Have a closer look at the Time Is Beer O’Clock T-Shirt. Sick of working long 8 hour days? This t-shirt will help you out. On this t-shirt it says “It’s 5 o’clock somewhere” and of course the o is a little clock. 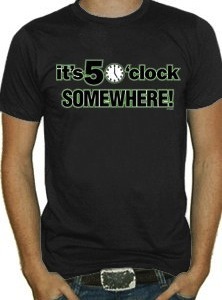 And this funny t-shirt is true of course with all the time zones it bound to be 5 o’clock somewhere. If it is 5 somewhere then that means that it is time to stop working and go have fun. Now it is time to get your own It’s 5 O’clock Somewhere T-Shirt. It’s Tool Time with Time the tool man Taylor. We all watch the funny TV series with not so handy tim and super handy all. Now you can have a Tool Time t-shirt. The t-shirt shows the words Tool Time and a measuring tape that also looks like a clock. And this t-shirt is available in a Tool Men and A Tool Girl version. Get ready for Tool Time in your own Tool Time T-Shirt.